Hit the Raritan this afternoon in search of some lifers and big fish. After an hour of delays and attempts to reach the spot, we arrive at around 4:30. Right away I see a quillback carpsucker lazily but actively feeding in the shallows. After a couple minutes of attempts with a worm and tiny hook, the fish spooked. Man, these fish are tough. I can now understand the frustration of other rough fish anglers when it comes to carpsuckers. Over the next 2 hours, the fish would return to the spot multiple times, each time ignoring my bait. I could place my bait perfectly and the carpsucker would ignore it, this happened hundreds of times. 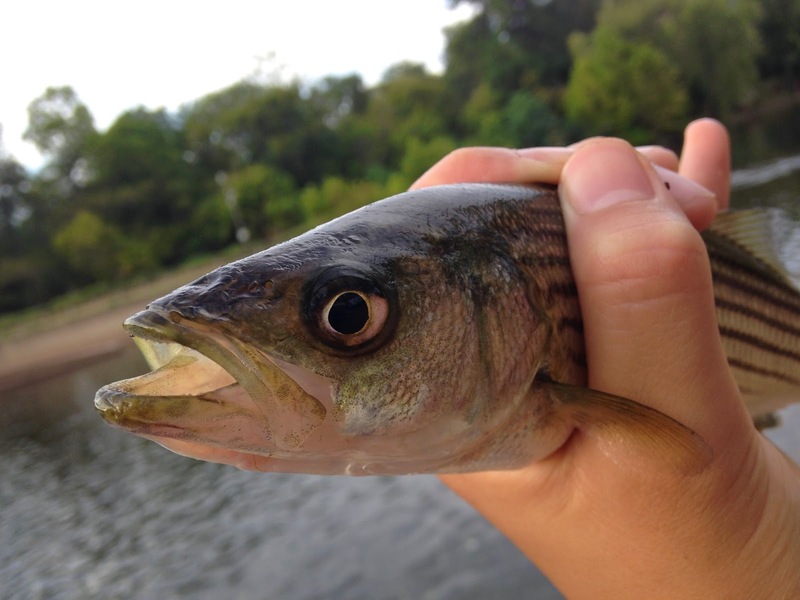 I decided to pursue other fish, like walleyes and smallmouth bass. I tied on a small chartreuse tube and began fishing. Remembering a smallmouth bass fishing video I watched, I decided to cast onto the foam under the dam. Reeling in, I was just about to lift up my tube for a recast when a fished literally smashed it on the surface. The fish wasn't big, but it sure was aggressive! I was thinking smallmouth until the fish flashed. STRIPER! I lifted it out of the water and it was mine. 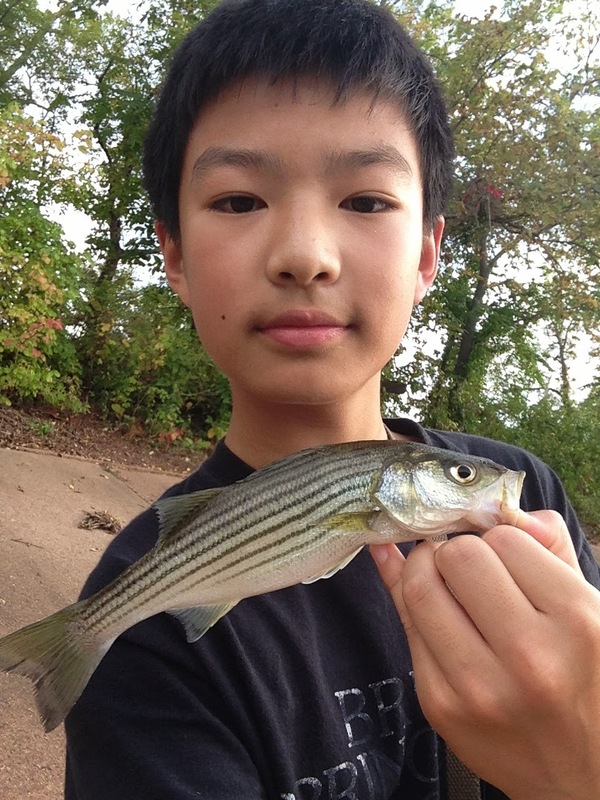 My first Striped Bass! I thought they only came in the spring on the Raritan. 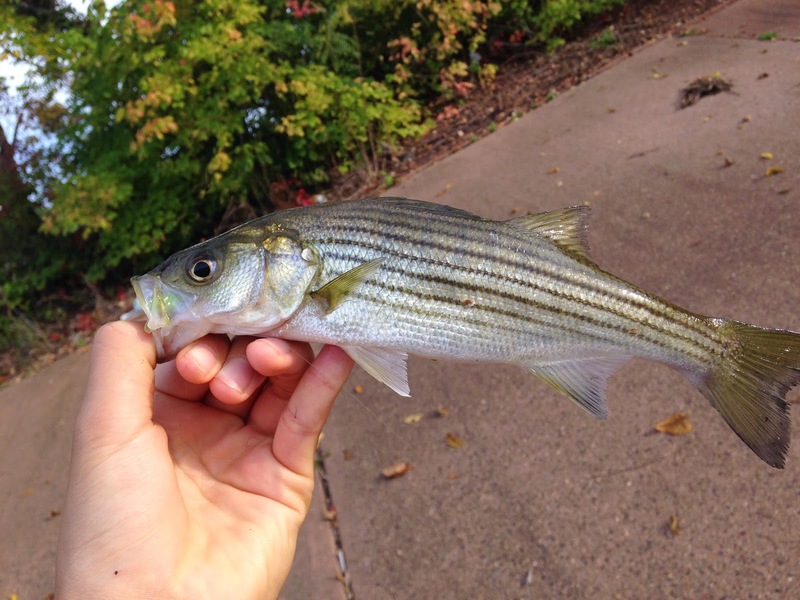 I have to admit, it was minuscule, but hey it's a striper! 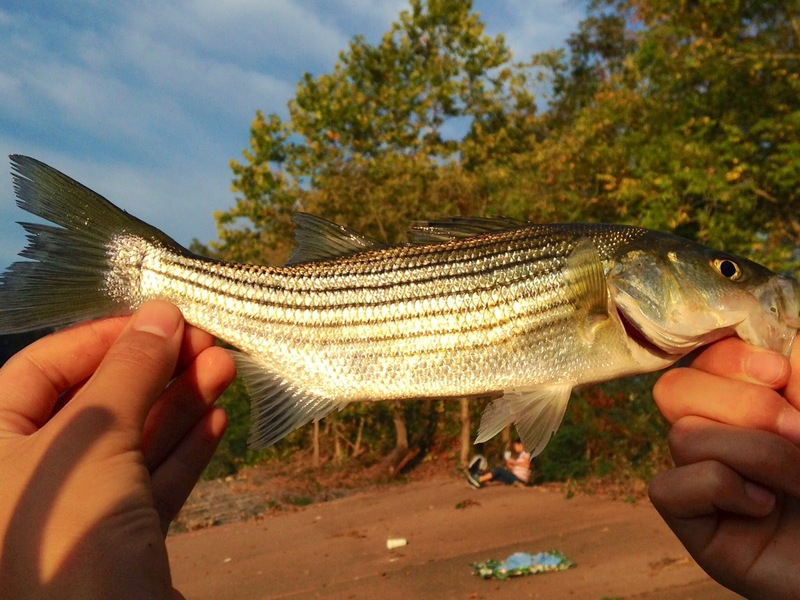 I was happy, since 20 years ago the Raritan was a nasty, polluted cesspool devoid of stripers. A half hour later my mom and sister joined me for a riverbank picnic. I declined in favor of continuing fishing. 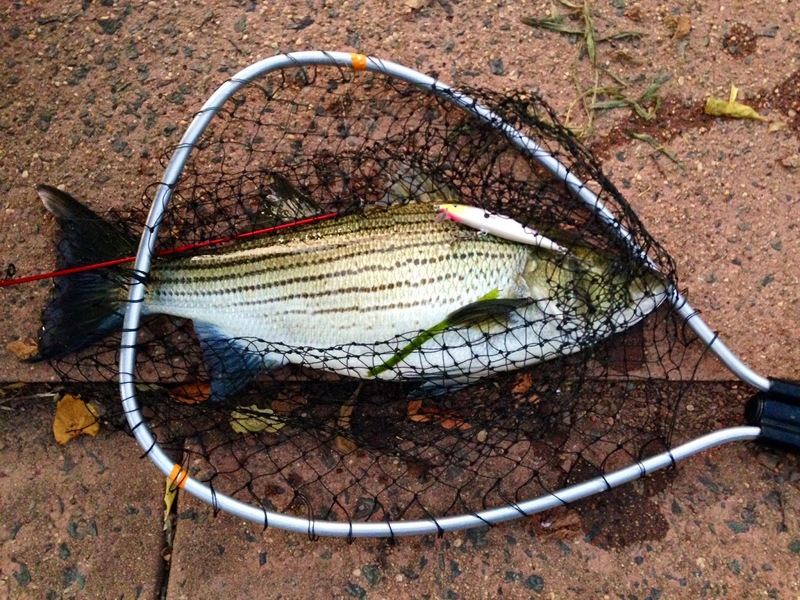 Under the same foam mat, I hooked another striper, this time a bit larger but still tiny. Another guy came to fish and snagged a huge hybrid pushing 15 pounds, released to live another day. With this big guy and stories of muskie, walleye, and quillbacks, I can't wait to return! I can almost guarantee that hybrid took a swipe at that bait and missed (foul hooked, snagging is intentional), you see this a lot with lures that have trebles. 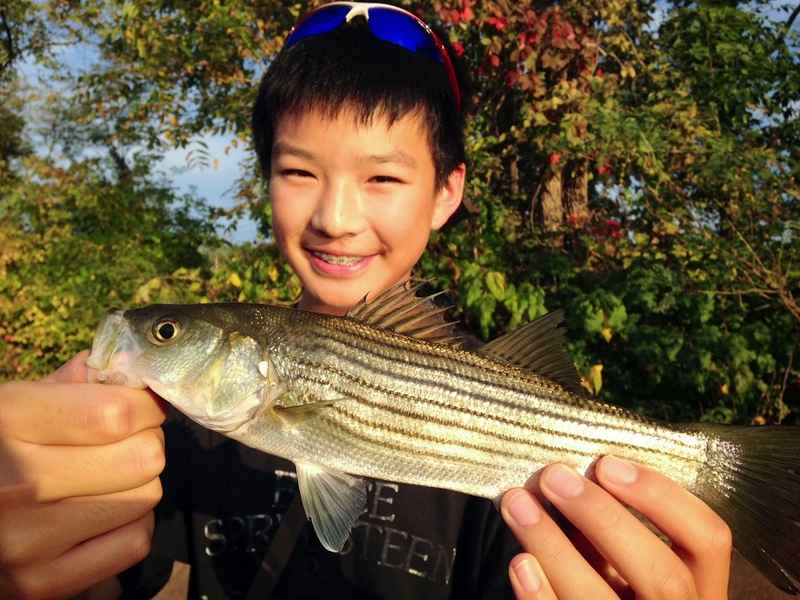 Little stripers like that are tons of fun, but you should try to get some big ones in the spring!